I left town yesterday for a week of road tripping and camping with friends. It’s definitely a challenge to eat healthy while in the car for five or six hours a day. We picked up baby carrots, low-fat string cheese, and a few other healthy snacks, but the yogurt-covered pretzels were impossible to resist. 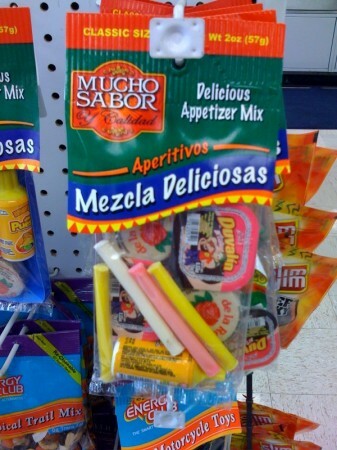 And the Mucho Sabor “Delicious Appetizer Mix” (spotted at a Chevron outside of Bakersfield)? I can skip that one — no problem.